Having a presence on Instagram as a wedding photographer is an excellent way to place your images in front of ideal clients. Many feel it is the perfect platform for wedding photographers to use to grow their business. There are several Instagram post ideas you can use to attract ideal clients and allow them to get to know more about you and your photography business. As a company that specializes in professional photo editing services for photographers, we understand how important your images are to attract and book your ideal clients. Variety in your images and posts helps keep your followers interested. Gain some new inspiration as you check out the top posts on Instagram professional wedding photographers use. As you get new followers, introductions are a simple way to share more about who you are as a person and photographer. When you share facts about you, your followers begin to trust you, which keeps you top of mind. Wedding photographer, Natalie Franke, uses #FridayIntroductions, where she shares 5 facts about herself. The facts about her give followers an insight into her personality, which allows her to build relationships with them. Related: Are you using these 19 hashtags on your Instagram account? Since your followers may be potential clients, vendors, and fellow photographers, mix up the type of inspiration you share. Everyone loves a good inspirational quote, or even to hear about your day and experiences. Temecula wedding photographers, Emry Photography, share inspirational quotes and insights to connect with their followers and fellow photographers. Because the wedding photography industry changes so rapidly, it can be helpful to share your expertise with your fellow photographers. To attract followers to your educational courses, webinars, and workshops, post about them on your Instagram account. The Scobeys inform their followers of their newest course and share the benefits of it. They also encourage followers to click the link in their bio, which will lead them to sign up for the course. Related: Are you using these 5 Instagram strategies to achieve your goals? On your account, you can also use Boomerang for Instagram to create unique videos. According to Instagram, Boomerang takes a burst of images, speeds them up, and plays them forward and backward to create a looping video. Boomerang is a great way to liven up your account and have some fun. Wedding photography duo, Justin and Mary Marantz, used Boomerang to create this video on their account. It is an opportunity for them to take part in Instagram’s exciting features, and diversify the what they share on their account. Another way to spice up your account is to feature a guest takeover or do one yourself. This places your brand in front of another photographer or vendor’s audience, which helps you attract new followers to your Instagram account. We featured wedding photographer David Manning on our Instagram account while at WPPI 2017. Take a look at our account to see some of what he shared. Be sure to follow us to see other great images and content from pro wedding photographers. As you share on your Instagram account, add in a few behind-the-scenes photos. These can be details of a wedding you are prepping for, or a product you are launching. You can also post about behind-the-scenes of your personal life, to continue to build trust with followers. Mckenzie Deakins shares about her trip to Disneyland. In the text, she encourages followers to head over to her Snapchat to see more videos of her experience, which attracts her followers to another social account. Tip: Any photos you share on your Instagram account should represent your brand. Outsource your photo editing to a wedding photography post production company to ensure each image is consistent and shares who you are as a photographer. To mix up what you share on your account, share about products. You can feature some of the products you offer your clients, such as albums, prints, or even unique gifts you send to clients and vendors. Plus, you can shout out to the vendors who are behind the products. Vanessa Joy Photography highlights a wooden album and the vendor who created it on her account. It showcases the product to her followers, so they can have these items top of mind when they book her. Whether you are a destination photographer or just love to explore, travel posts are a great addition to your Instagram account. They invite followers to experience stunning locations with you, and may encourage them to book you so they can go to certain locations. International wedding photographer, Abby Grace, shares about her travel experience. The photo showcases the beautiful landscape and allows her to connect with followers who also love to travel. Outside of your wedding photography business, you have a life that many of your followers may not know anything about. In your rotation, share a bit about your family and friends, or activities you enjoy. These are things that allow you to connect with your followers. Orange County wedding photographer, Ning Wong Studios, shares about his family on his Instagram account. He highlights his wife on Mother’s Day, which shares more about his personal life with followers. When you try different Instagram posts ideas on your business account, you provide followers with a look into who you are as a person and photographer. Continue to build trust with followers with the tips from Instagram photographers in our free Guide: Instagram for the Wedding Photographer. 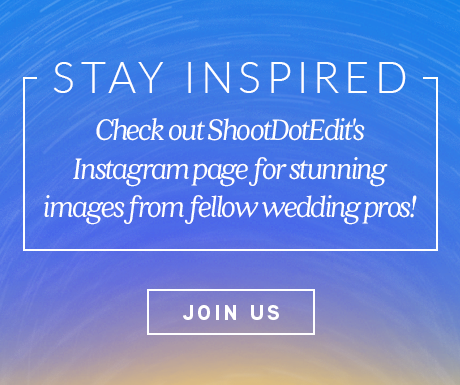 Click on the banner below to download it and gain wedding photographer Instagram tips! ← Facebook Hashtags: Should You Use Them for Your Photography Business?